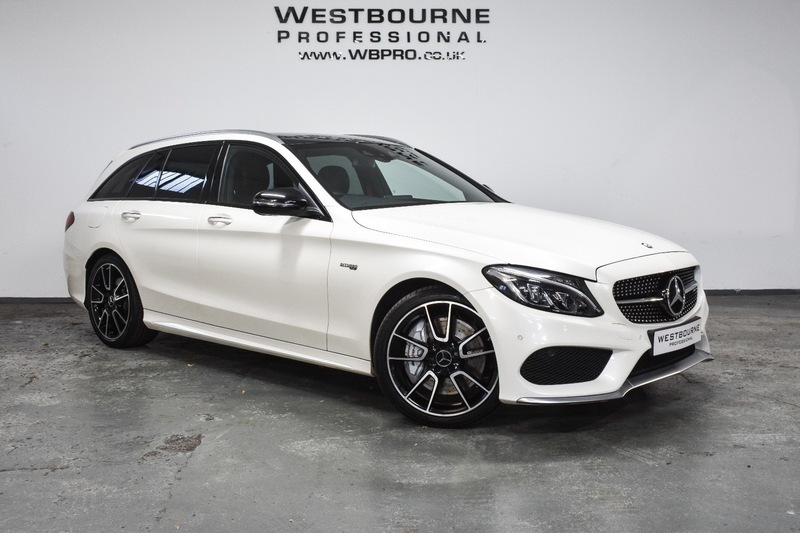 We are delighted to offer for sale this 2017 C43 AMG Estate, equipped with the must have Premium Plus Package and with immense specification including Burmester Premium Sound System, Heated Electric Memory Leather & Alcantara Seats, Panoramic Sunroof, Keyless Entry & Start, Comand Satellite Navigation, Switchable Sports Exhaust System, Front & Rear Parking Sensors with Reverse Camera, Power Tailgate, Dynamic LED Headlights with Daytime Running Lights, 19" AMG Double Spoke Diamond Cut Alloy Wheels, Electric Steering Column Adjustment, Automatic Dual Zone Climate Control, Cruise Control, Power Folding Mirrors, Bluetooth Telephone & Audio Connectivity, DAB Radio, Active Park Assist and much more. Presented in superb condition throughout finished in the much sought after colour combination of Diamond White with Black interior with contrasting Red Stitching & Seatbelts. Westbourne Professional are an award winning dealership, proud to be an AA Approved dealer with all our retail vehicles supplied HPI clear with Warranty, MOT, Independent Mechanical Inspection and 12 months free AA roadside assistance. Full dealer facilities on offer with us include part exchange, 12, 24 and 36 month warranty upgrade, finance (subject to status), UK and European delivery, tow bar fitting and much more. Our 5,000 sqft indoor showroom is located in a historic army barracks close to the Sheffield city centre and just minutes from the M1 and Sheffield Train Station. In order to offer the personal service we pride ourselves in, all viewings are strictly by appointment only. ***Free Delivery available within 300 miles of our showroom, additional mileage at £2 per mile.